Ellie has given us a beautiful blonde filly, with long legs, terrific angles, and sweet aura. 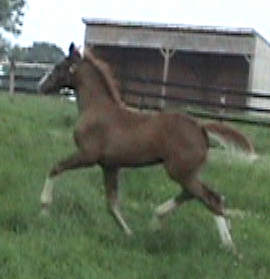 Very flashy, with her golden coat, three knee socks and a blaze, she is remarkably like her 1/2 sister of 2006, Lasting Impression (aka “Lola”, by Landkonig). I’m thrilled, as I never imagined Ellie could produce another foal of Lola’s calibre. I feel I’ve been given a gift, at a time when we are mourning the loss of EM Bretania and her Quaterback foal. Shining Bright is by Starlight, the dazzling Sandro Hit / Cordeur / Argentinus son who was schooling all the Grand Prix movements by 8 years of age and competing successfully at Prix St. Georges. He was also undefeated on the line at breed shows, always “Champion” with no score under 85%. 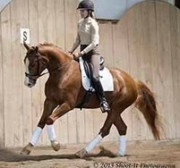 In 2007 he was chosen USDF/DSHB Horse Of The Year. I see his generous temperament reflected in this filly.